'A Picture of Dorian Gray' is re-interpreted by Barrett as a self-portrait, alluding to his younger years as a fashion model. The artist – the subject of the painting – wants to be perceived as attractive, but his beauty becomes distorted and fragmented when reflected in the mirror. In Oscar Wilde's novel, The Picture of Dorian Gray (1891), Dorian sells his soul to the devil to ensure that his portrait, rather than he, will age and fade. The central theme of the novel is aestheticism and its conceptual relation to living a double life. 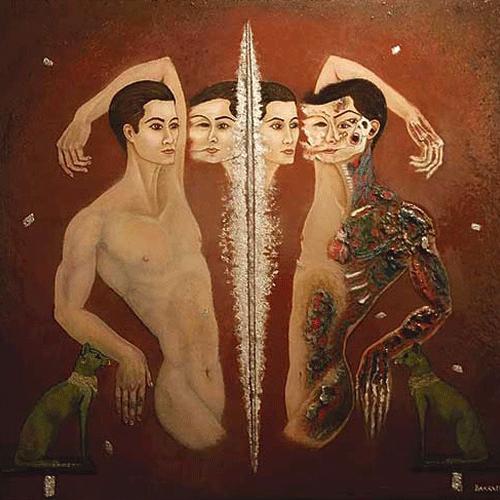 In Barrett's painting, the reflection in the mirror represents the artist's inner self; the globules of discoloured flesh depict deterioration and morbidity, symbolising inner turmoil beneath the façade of youthful allure. There is a clear discrepancy between outer and inner beauty. Beyond the personal, the painting also offers a broader commentary on the world of fashion and celebrity, with its reverence for eternal youth, and points to the darker side of the industry; behind the airbrushed images served up to the public is the ugly and distorted face of fashion that values the pursuit of beauty at any cost. © 2017 Mitchel J. Barrett, all rights reserved.